We went to Friendly Center Saturday, December 9th to test out how Mara would do around Santa this year. As you can tell from the pictures, not so good. It doesn’t help that she’s been under the weather for the last week and the nap before this visit wasn’t a good one. They have a nice Christmas scene before you even walk in to see Santa which is where the some of the shots were taken. We took some before and after her visit with Santa. Santa helped out by offering her his stuffed reindeer Rudolph to hold and when that didn’t work he broke out the jingle stick which amazed her for about one second before the crocodile tears started to pour again. She will encounter Santa again Sunday at Parker’s 2nd birthday party but this one is a bit more familiar to her. We’ll keep ya posted on how it goes. p.s. that thing around her neck is her “rabbit stole”, a cute and funny scarf to keep her warm this winter. Remember to click on the picture to see the complete album of pictures. 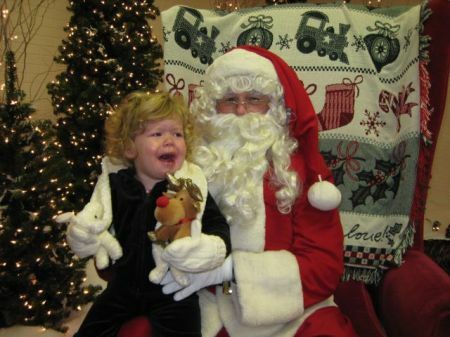 Well, at least she would sit with Santa! Grace screamed as soon as we approached him! Thank goodness Dani never had an issue with him though. So, yet again we got a picture with Dani and Santa and not Grace. Maybe in a few years both of our little girls will realize Santa is no harm! First we tell them not to talk to strangers and then we put them on a strange man’s lap! Santa is kind of creepy looking if you think about it! We have not taken Thomas yet-it should be interesting. Davis is ready to tell Santa all the gifts he would like. Oh, come on. She loves the rabbit. She talks to him, and hugs him and kisses him. I’m not really sure why she is creeped out by Santa. Strangers in general don’t usually make her cry at sight. She did talk to him though when we prompted her, between whimpers anyways.